Unlike his brother Shern who was half-potty trained at 33 months ( I said half because he still wore diapers to sleep at night), Khye was not ready at 33 months old. In fact, Khye was still not ready last month when I tried. How did I know he was not ready then? Well, I tried a few months ago. I took out his diapers and he cried, wailing for me to wear him his diapers. A month later, I tried again and when he peed on the floor, he sat on his own pool of pee and played with his pee! "_"
Well, I let him be. I mean, I didn't have the heart nor the energy to push him. I knew he would be ready soon. I knew because Khye has grown up pretty fast all of a sudden since he turned 3yo. He had his first happy haircut, went to the doctor without being scared, and his vocabulary widened so much since then. So on 5th Sep 2015, Thursday, we took off his diapers and he did not protest. First step successful. Then we told him to let us know when he wanted to pee. Both Khye and I were really happy with his first pee in the toilet bowl! 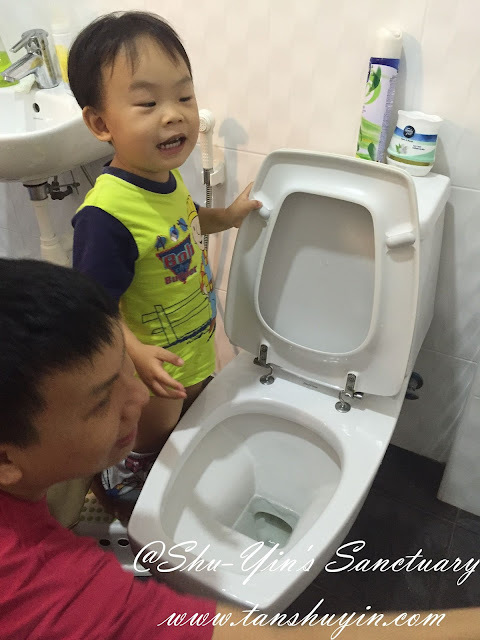 First time Khye pee-ed in the toilet today! He was as excited as me as we both watched his pee trickled down the toilet bowl! Haha! He used to hate those child potty but now ok with the toilet bowl. It was really a happy moment and I could see that Khye was also beaming away. 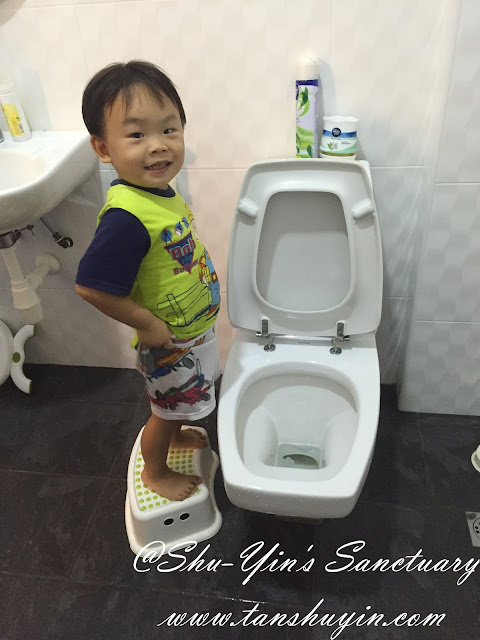 I encouraged him and praised him by clapping for him and let him flush the toilet himself, so he felt like a big boy indeed (well, this trick didn't work earlier on though but somehow it is working now!). Day 1 could be considered quite successful already. There was no accidents at all although there were 'fake calls', meaning he said he wanted to pee but when we brought him there, there was no pee. Many times in fact. 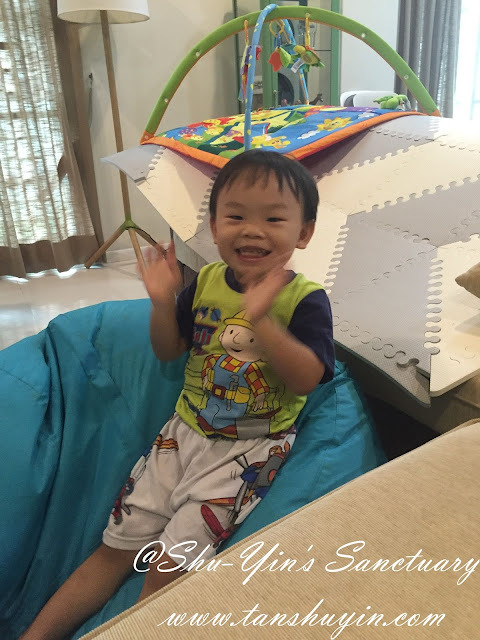 Day 2 Friday, I took the plunge and took off his diapers when we sent him to playschool. Told the teachers there to look out for him (and his pee! haha)! Teacher told me he had an accident once during outdoor play. Too engrossed with play I supposed. And the teachers said there were a few fake calls as well. Day 3 was Saturday which was good because he was at home. It was good. One accident though because he was crying and throwing tantrum and so he wet himself. "_"
Sorry, Khye is currently in his "threenager phase" at times. lol. Day 4 Sunday, he was in grandma's house for the morning and mum said he even poo-ed in the potty! I was soooo happy! And no pee accidents at all! Day 5 & 6 was Deepavali break. Khye pooed in Ah-Ma's house and everyone there clapped for him much to his delight! And Khye even went to the restaurant and mall without diapers! He peed in the public toilet so I am really proud of him. Day 7 was the real test as it was school day again. And I am proud to announce that the teacher reported no accidents! Yay! ANd so it has been a week and I must say that Khye is progressing really well. So I can say that pee and poo training can be considered quite successful as of now. So I just need to soldier on!! !